Argon gas has been used as insulation in dual-pane windows for years now because it is a much better insulator then regular air space; so it would seem only logical that people would be looking for other uses for this safe insulating gas. Ergodyne has come up with a use for argon, but it is in probably the last thing I would have expected, clothing. The Ergodyne N-Ferno 6900 Warming Vest does away with all of the conventional insulating methods, and gets all of its insulating power from the use of argon gas. 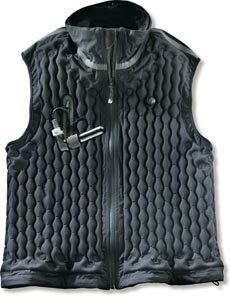 The vest itself is made up of a nylon shell that houses a layer of 4.5mm argon filled cells, and the thickness of the cells can be controlled by the user. This allows the wearer to control the amount of insulation on the fly. Only 4.5mm of argon gas is needed to produce the same amount of thermal conductivity as 14mm of the best synthetic or natural fibers on the market. This means users can get the same amount of warmth using this lightweight vest vs other bulkier outerwear. The N-Ferno 6900 Warming vest is available now for about $200, and includes three 8 gram refill canisters of argon gas. At that price, lets hope you don't accidentally puncture it.